The point, line, plane and solid objects represent the first three dimensions, but a kind of reversal of space is involved in the ascent to a fourth dimension. Steiner leads us to the brink of this new perspective—as nearly as it can be done with words, diagrams, analogies, and examples of many kinds. In doing so, he continues his lifelong project of demonstrating that our objective, everyday thinking is the lowest rung of a ladder that reaches up to literally infinite heights. Cover Image credit: Light refracted through a small sample of water while under vibration. From a series of experiments by Dr. Hans Jenny in Cymatics. The photo is from the book Cymatics: A Study of Wave Phenomena and Vibration by Dr. Hans Jenny, published by in 2001 by MACROmedia (used by permission). 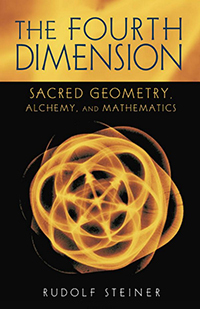 The Fourth Dimension is a translation from German of Die vierte Dimension Mathematik und Wirklichkeit (GA 324a).